How Much Does it Cost to Install Under Cabinet Lighting in 2019? Many homeowners who are renovating their kitchens are opting for darker colors than in the past. Dark wood and bright colors are becoming more popular again. With all these dark colors, particularly in kitchens with only a few windows, artificial lighting is crucial. A natural and warm space for lights is under the cabinets. Under-cabinet lighting is becoming more affordable, making them a more popular choice for the typical kitchen. The average price for an under cabinet lighting project is $1500 to $2500. While you’re considering upgrades, check our cabinet painting cost guide if you plan to repaint your cabinets before adding lights. Another handy guide to consider is our tile and backsplash cost guide if you need it. There are dozens of choices for under cabinet lightings, and we will discuss a few of the options for you and the likely cost. However, it can be very challenging to predict the overall cost with any degree of accuracy, given that labor costs vary widely. Labor is one of the most significant parts of the project price, so the labor rate is a major cost factor. The national average for a single under cabinet light install is $421. That figure can change dramatically if the lights used are hardwired, plugged in, or battery-operated. A qualified electrician should always install hardwired lights. Under cabinet lights that need hardwiring are less expensive as part of a remodel so the electrician can lay everything out before covering the walls. Keep in mind that an electrical inspection may be required in your area, and will add to the cost as you’ll need to pay both the inspector and the electrician for the time. Consult your electrician or local codes to determine if an inspection is required. Even DIY projects can vary due to the wide range of material costs. Keep in mind that even a DIY project could still require an electrical contractor to install the wiring. Electricians charge from $30-35 per hour up to $80 or even $100. These incandescent or gas filament strip lights are usually six or seven inches long and cost about $40 or $50 each, though you can get custom lengths for more. These are not as energy-efficient as LED or fluorescent. The location of your kitchen outlets will determine if you need to buy additional extenders that come in 4’, 8’, or 12’ lengths for $8-12.00 each. These lights use less energy, last longer, and do not produce as much heat as regular lights. LED lights cost more initially than fluorescent or Xenon. Many electricians warn against using the tape strips as the adhesive does not last long, especially around the stove, where they are exposed to heat and steam. It will cost around $500 to $550 for five strips installed by an electrician. However, if you are using the tape strips and plugging those in, you could save around three-quarters of that amount. Using fluorescents as under cabinet lighting is one of the least expensive methods, both initially and energy-saving. You will pay $90-200 to get each of these installed, though installing more will cost less per unit. As a DIY project, if the outlets are already in place, could be much cheaper. You might want to consider lights inside or above the cabinets. That should not add much expense during a remodel but adding these features as a standalone project could be costly if these need hardwiring. The total for your project depends on how many lights you need and will be approximately $1500 to $2500. Lights above the cabinets could add another $500 to $1000. Those figures include installing five under cabinet light fixtures, which is the national average. Our calculations are based on typical expenses, and you should use these as a guide to compare written quotes provided to you by reputable professionals in your area. Get three or more estimates and analyze what the contractors say they will do. Make sure they are licensed and insured and check with your local building inspector’s office to find out what permits and inspections are required. Typically, new electrical wiring will require an inspection before you cover the walls. 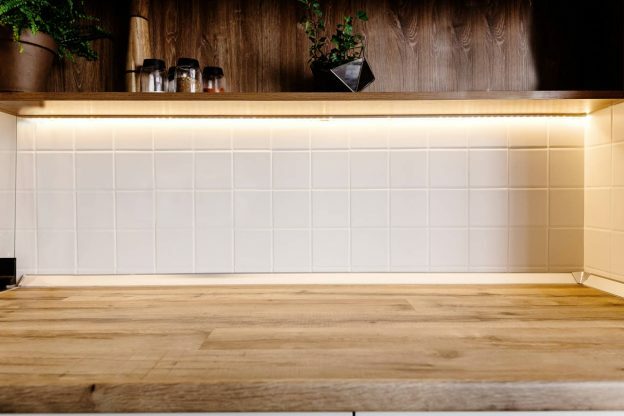 Under cabinet lighting could be an inexpensive method to brighten your kitchen, highlight your cabinets and backsplash, and make it look brand new. Explore our kitchen renovation and project resources to plan your kitchen update.